Kenya witnessed the launch of Windows 10 with Satya Nadella late last month. Windows 10 is believed to be the most secured and it’s looking up for business owners. If your Windows 10 Hard Drive is crowded you can clean it and improve speed by getting rid of files and moving data to other devices. The recycle bin has not changed at all since Windows 10 still uses the recycle bin to hide all the files you want to throw away, and emptying it out can prove effective in freeing up extra space. You can right-click on the recycle bin icon for the option to directly empty it. If you can’t find the icon, then head to the Start menu, go to Settings, select System, then go to Storage. You will be able to select local storage under This PC – look for and click Temporary files. This will bring up any locations for temporary files, including Recycle bin. Under Recycle bin, select Empty recycle bin, and confirm your decision. Digital Trends provides that cleaning the recycle bin only helps to clean Windows 10 hard disk if there’s a lot of deleted items in that bin. When Windows 10 is first downloaded and long afterward, depending on your desktop habits – emptying the recycle bin may not affect your hard drive much at all. Deleting temporary files and downloads. These files are usually automatically deleted, but sometimes they never leave the system. Get rid of them all by selecting Delete temporary files in the Temporary files folders. Windows temp files are used to manage document editing, some application processes, various printing tasks, and so on. Sometimes files are automatically created when you download staffs from the internet. The files pop up in your Downloads and tend to stick around – which means they can quickly stack up if you are downloading a lot of content to your Windows 10 desktop. You can also find downloads in the Storage section of your desktop (Settings > System > Storage). Select This PC and go back to Temporary files. You can visit Downloads from this section. Select View downloads and delete any files that you no longer need by highlighting them in groups or individually. This is a great way to clear out space manually without accidentally deleting something that you’ll need later. Uninstalling Apps is easy. Most people downloaded many Apps due to excitement. Downloading many things slows down the system and reduces the amount of space. Some apps can take a lot of space. The trick in avoiding that is finding which hog the most hard drive room, and which you can live without. So how do you uninstall them? From the Start menu, go to Settings, select System, then select Apps & features. Here you can see all the apps downloaded. 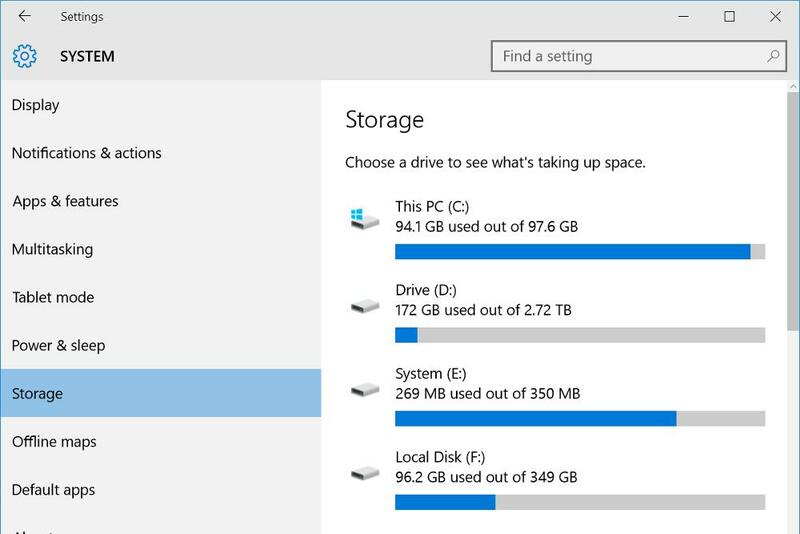 Windows 10 allows you to arrange them by various statistics – if you have a long list, arrange them by the amount of hard drive space they are taking up. See which apps are hogging the most data, and delete those that you can live without. Double check that the app doesn’t have anything too valuable on it, then select it and choose Uninstall. Windows 10 allows you to change how you use OneDrive. This is a cloud service for Windows hence all the cloud data used helps free hard drive space except the ability to save files offline. If you are dealing with sensitive files or very important projects , it’s good to have a backup. But if you are using OneDrive and automatically saving offline for every file and doc at work, school or home, then you probably wasting hard drive space. The OneDrive is on the right side of the task bar. Click on the cloud icon and choose Settings, then select the Choose folders tab. You will be directed to all the files types that OneDrive is saving offline, and how much space each are taking up. Unselect all the OneDrive folders that you don’t absolutely need. You can still access all these files online at OneDrive.com, so you aren’t really losing anything. Another simplest way to clean your Windows 10 Hard Drive is moving extra data to an external drive. Get a hard drive that is properly formatted and ready for uploads. Dragging and dropping a file into the new drive will create a copy of the file, allowing you to erase the original. You can also move large chunks of files at one time. Open your File Explorer on the taskbar and select all the files you want to move outside your PC hard drive. Once they are selected, go to the Home menu, select Move to, then select Choose Location. Pick your external drive from the list, and it will drop all files at that destinations – you don’t even have to erase anything afterward.